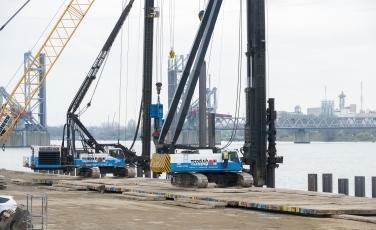 Terracon Funderingstechniek B.V. was recently contracted by Strukton International as the specialist of foundation works for a project, which took place in the port of Antwerp, Belgium. The main contractor of Quay Wall AWN Kanaaldok B2 project was Gemeentelijk Havenbedrijf Antwerpen and the designer was Havenbedrijf Maritieme Infrastructuur Antwerpen. The contract which was valued at € 2.515.000,00 required Terracon Funderingstechniek B.V. to install a combi-wall comprising of 123 tubes, with a diameter of 1220 x 18 mm and a length of 22.5 metres, and 122 sheet piles AZ 24-700 with a length of 18.5 metres. The wall was anchored by installing 123 MV piles, HP360 * 109. The project, Quay Wall AWN Kanaaldok B2, started in February 2016 and finished in August 2016.